It’s been a while since my last article. Ravnica Allegiance has been released and I’ve been tinkering along with updates for my trusty Izzet Drakes and White Weenie deck. I also discovered that a new deck is slowly emerging in Standard, the 4-color Gates deck. A deck designed to take advantage of the many new Gate pay-offs that Ravnica Allegiance provided us with. As you all know by now, the way I prefer to build Gentry decks is to look at new promising Standard decks and try to port them over to our lovely Gentry format. This new deck seems tailor-made for that, as most of its pay-offs are not vacating any Rare or Mythic slots. It’s interesting how much Ravnica Allegiance helped this deck take form. The Gate pay-offs have received some big additions, and where before you got acces to 6-mana 8/8 fliers and 5 mana 3/3 Double Strikers now you get 0 mana 8/8’s and a Wrath of God. I would describe this deck as a hybrid between Ramp and control. You’re aiming to ramp up your mana with cards like Growth Spiral and Elvish Rejuvenator. 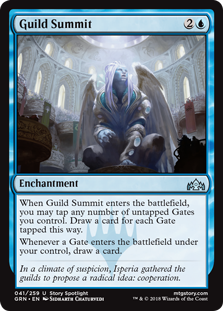 Once you’re established you can start controlling the board with Gates Ablaze, get card advantage with Guild Summit and eventually beat them to dead with a huge Gatebreaker Ram and Gate Colossus. 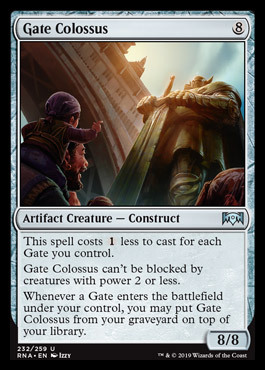 They Murder your Gate Colossus? No problem, just play a Guildgate and you’re sure what your next draw step is gonna be. But all these powerful options come with a hefty price. You have to run a deck with 19 lands that enter the battlefield tapped, thus setting you on the back foot most of the time. Time will tell if this drawback will be too much to handle for the deck, but the pay-offs seem well suited to claw your way back into the game and turn the corner very fast. To further facilitate this, I included some sleek options that can easily be cast off-curve and dig you to your Gates Ablazes or Gatebreaker Rams. Opt, Growth Spiral and Shimmer of Possibility are all examples of this. Let’s start with examining the mana base. 19 guildgates and 7 basics. This seems to be a fine number as the deck is essentially Simic with a splash for Red and White. The white is a splash for Revitalizes in the sideboard, 8 sources may seem a little low but I’m banking on the ramp and cantrips to find the white source when needed. You need some basic lands because there are times you want to land your spells on curve. Especially on turn 3 you either want to cast a Gatebreaker Ram, Guild Summit or Gates Ablaze and start building from there. Note how each of those cards fill very different roles. It’s up to you, and the deck you are facing, to decide which one is the most optimal choice in any given situation. Your play pattern in the early turns will almost always be the same: play 2 Gates, maybe play an Opt in between, and start casting spells as early as turn 3. This can come in on turn 3 as a 4/4, or on turn 6 as a 8/8. That’s an insane rate for a 3 mana creature. 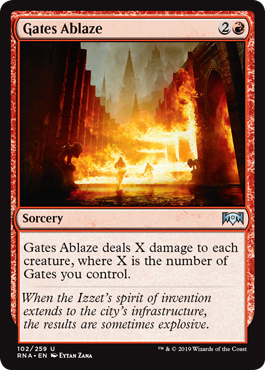 It also never, never, never dies to Gates Ablaze, which essentially gives this deck a 1-sided 3-mana Wrath of God. Together with Gate Colossus, this is one of your win conditions. It’s also really good at brick walling creatures from White Weenie or Mono Red. Just be careful when playing against Jeskai and Izzet. Don’t expose it to Lava Coil! Trample and Vigilance puts it completely over the top. On the one hand your opponent can’t chump block it and on the other hand you have a huge blocker. This makes the Ram very difficult to race. Settle the Wreckage! It’s also semi-unblockable, which is quite relevant. Together with the Ram this deck is very resilient to decks that aim to go wide and leave back some chump blockers to win the combat race. This is the way to get yourself back into a game when you’re behind. The mere existence of this card allows you to keep up with decks like White Weenie and Mono-red. It’s even better in this build because most of your creatures survive the blaze. You can clear out all their blockers and start crashing through with your 12/12 Ram! It’s really sweet against Izzet Drakes, as Dive Down usually won’t save their Drakes and you can easily play around Spell Pierce. That said, the card is completely dead against control decks without creatures, but I think that most controlling decks will at least play some creatures to win. Be it Basilica Bell-Haunt, Niv Mizzet or Chromium the Mutable. Gates Ablaze will take care of any of those. 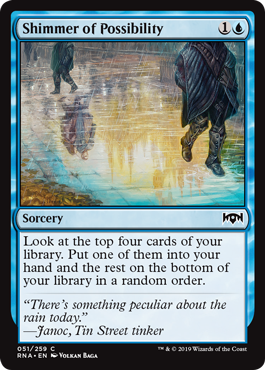 I really like how they designed this card to only cost 3 mana instead of 4, leveraging the fact that it’s only playable in a deck with lots and lots of Guildgates. 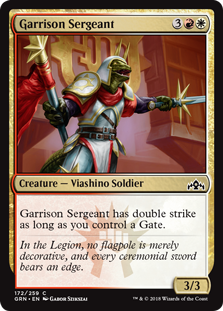 Standard has been devoid of a Wrath of God-like card for a long time, and now we’re getting one that’s even playable in Gentry due to its uncommon rarity. I can imagine a Jeskai or Grixis control deck that plays something like between 10 to 12 gates in order to facilitate Gates Ablaze. That’s a big upgrade for these kind of decks because before they had to give up one of their 4 rare and mythic slots for the likes of Cleansing Nova and Settle the Wreckage. This frees up more space for cards that actually win you the game, although some people would state that win conditions in control decks are overrated. Some additional ramp and cycling for the deck. Between this and Elvish Rejuvenator, the deck will often drop a lot of lands on the battlefield early. Growth Spiral is an additional sleek card to help smooth out the curves of this deck a little bit. It’s funny how Growth Spiral is meant to increase your mana count, but in this deck, it’s actually putting you on “normal pace” because all your lands enter the battlefield tapped. A couple of Negates will get you a long way with protecting your creature spells. It’s also good synergy with Growth Spiral as you can just leave 2 mana up and if you don’t want to counter anything just play Growth Spiral and get some mana advantage. Shimmer of Possibility in the hopes of finding the Nexus again. ( I didn’t..) On the other hand, the deck also plays Growth Spiral, Negate and Expansion//Explosion in the same slot, which are all instants. So Anticipate might be the best inclusion after all. Another one of the sleek options to smooth out your draws a little bit. As I’ve said before, this card has the lowest impact overall but you’ll be happy if you cast it on turn 2 to find your Gatebreaker Ram or Gates Ablaze. Or later in the game when you don’t need any more lands but are looking for some action spells. Remember Sphinx’s Revelation? Last time this kind of effect was in standard it was a staple of the format. Sure, they toned down the effect by only letting you draw half of X-cards, but instead you’re getting a X/X Flampling Jellyfish Hydra Beast (oh Simic…) I think you can include a lot of different rares in this type of deck, but I’m fairly sure all builds should include Hydroid Krasis. It’s just the best card for this type of deck, helping you get back in the game by gaining you some life, drawing you some cards and just being a giant flying beater. I’m not sure if Vivien has a home in this deck, but somewhere in the back of my head there’s a voice telling me I need to include 1 maindeck answer for artifacts and enchantments. I’ve gotten to use her for good effect so far, when I discovered that Ixalan’s Binding is actually a very very good answer to Gate Colossus. Apart from that, Vivien has some uses against basically every deck apart from the hyper aggressive mono-red. The ramp strategy also allows you to sometimes drop her a turn earlier, which is especially powerful against some strategies. You could make the argument that this is in fact a Nexus of Fate deck, but the card has more of a supporting role here. You can turn the corner very fast when you’re in the late game. Just drop some Gate Colossi for 0 mana, cast a Nexus of Fate and attack your opponent to 0 before they ever take their next turn. Also, with Guild Summit and the other card draw spells you see a large percentage of your deck most of the time, so chances are Nexus will pop up a second time. Duress to good effect and I’m looking forward to copying some other sweet cards from my opponent. The converted mana cost of Gate Colossus is 8, so when you drop a Sunbird’s Invocation and play a Colossus you get to dig 8 cards deep to either find a second Colossus or god forbid, Nexus of Fate . Include this rare if you really want to go all-in on the Nexus of Fate plan. I can see the appeal of playing this card. You know, it’s a really big bad looking Dinosaur. But I fear the idea of dying with this card in my hand. For that reason, I chose to include the “X” cards as my rares of choice. The modal nature of “X” gives me more wiggle room in the earlier turns. I’m especially dreading getting to 9 mana, casting my big bad Dinosaur just to have it countered. This card pops up in the standard version of the deck but I still need to be convinced how good it is in Gentry. I’m just not seeing it here. 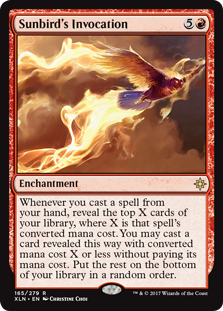 Star of Extinction: If you believe 4 Gates Ablaze isn’t enough mass removal or you want some additional answers against planeswalkers. The deck only plays 7 basic lands so you won’t get to activate it all that much, but the many ramp effects will get it to flip faster, which could actually prove very decent in the mirror. Gatebreaker Ram survives Gates Ablaze 100% of the time. Multani will survive it 97% of the time. 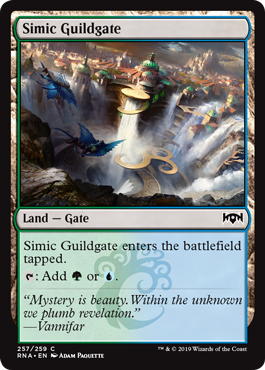 Just make sure to have 1 non-Gate land. That being said, Gatebreaker Ram and Gate Colossus both are cheaper to cast so I don’t want to waste a rare slot on a card that’s worse than my uncommons. 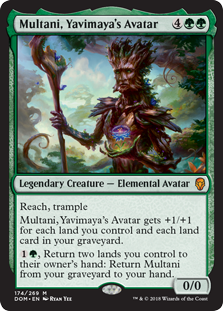 If there would be some more self-mill in the deck I might want to include Multani, but with this version I would never play her. If you want to go really big on the mana, just include a rare that will at one point provide you with 3 treasures. Play this card if you want to play big Explosions. Never leave home without some form of enchantment of artifact hate. You never know what you might run into in Gentry. I’m expecting some decks with Wilderness Reclamation to pop up so I might even up the count to 3. The plan against the aggressive decks. You side out your expensive spells and redundant cantrips for Revitalizes and Shivan Fires, and try to win with your Rams and Collosi. It’s possible the mana base needs some adjustments though, as you only have 7 white sources as of now. But as I’ve stated at the start of the article, the deck has lots of ramp and cantrips which will help dig me to my white source. As a second argument I would like to quote an article from a certain Mike Flores on the date of May 19, 2014. This means I don’t require my white mana source on turn 2 of the game in order to stand a chance against the hyper aggressive decks. I’m playing with 20 lifepoints and a deck well suited to sweep their board and play huge undercosted blockers. This means I only need my Revitalizes to help me get out of reach of their burn, which will probably be around turn 5 or 6. Thus I need to find my white source after seeing about 12-13 cards instead of 7-8. Thus I don’t even need 14 white sources to start with. Basically, I’m fine with 7 at the moment. Further testing will prove if my theory is sound. Also against the aggressive decks. Bring out those Guild Summits, Vivien Reid, and Expansion//Explosion to add more cheap interaction. Some more slots against the aggressive decks. A timely Root Snare will win you the race against the aggressive decks. They won’t play around it and alpha strike you. You will cast this and win on the following turn. Also, it’s quite good against Bladebrand. This one could be about anything you want but I’ve chosen to include 1 Essence Scatter. It’s possible Spell Pierce is the better choice but this isn’t really a tempo deck either. Maybe good old Cancel should do the trick in this slot. If you know what I should include as the 15th sideboard card, don’t hesitate to let me know on facebook. I’m always open for feedback.